7digital has announced that its music store will come pre-installed on the BlackBerry PlayBook. RIM and 7digital have a bit of history of partnering up. Back in 2009, the 7digital download service was launched for BlackBerry handsets, with 7digital CEO Ben Dury announcing at the time that working with BlackBerry was key to the 7digital launching in the US – something it did at the tail-end of 2009. This new partnership sees the BlackBerry PlayBook music store powered by 7digital's API, which means that PlayBook users will be able to search for tracks, albums and artists and preview tracks before making a purchase. 7digital's recommendation technology is also on board, so you don't have to rely on search to find new tracks. "We're really excited to be working with RIM to bring the 7digital experience to the BlackBerry PlayBook," said Ben Drury, CEO 7digital. "RIM has created an incredible tablet with premium multimedia features and together we are delivering a truly exceptional music experience for mobile users, offering content that is extremely easy to discover, purchase and use. "We currently have the largest international footprint of any MP3 digital music seller and we look forward to expanding our business with RIM throughout the year." 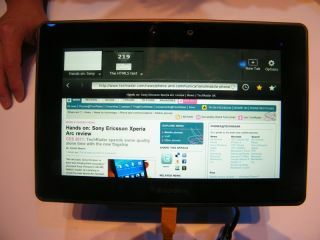 This isn't the first tablet 7digital has found itself on. Back in October, the company announced that it was chosen as the primary music service for the Samsung Galaxy Tab. The BlackBerry Playbook UK release date is mooted for late Spring, but you can check out our hands on BlackBerry PlayBook review to see how well the tablet performs.